Isn’t it amazing how a simple taste of a treat can spark so many memories?! 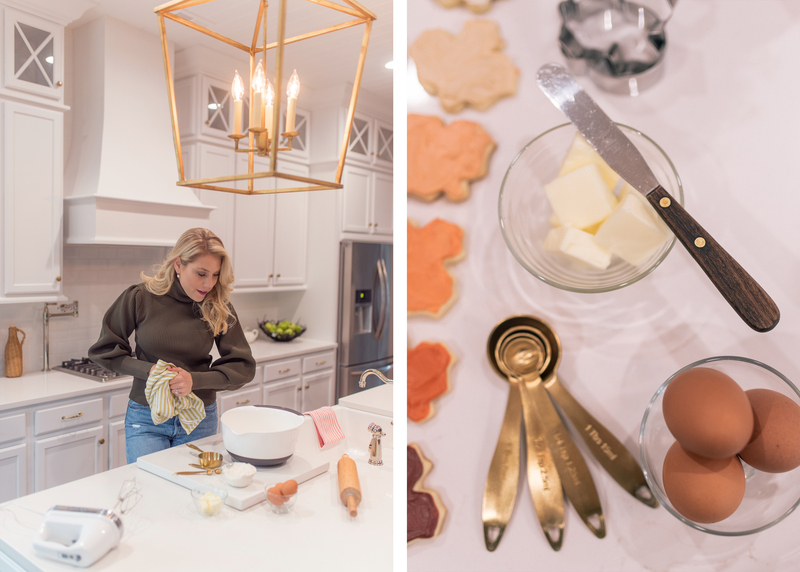 A few weeks ago we whipped up a this sugar cookie recipe that I enjoyed so much as a kid. It instantly took me back to my childhood with the first bite. I have fond memories of baking and decorating cookies around the holidays. Heck, I spent most of my childhood in the kitchen eating my body weight in pastries and desserts. My dad, who is an executive chef, specializes in pastries. The years that I spent with him in the kitchen are some of my greatest memories. I am excited to pass this recipe along to my kids one day, and hope you love them too! 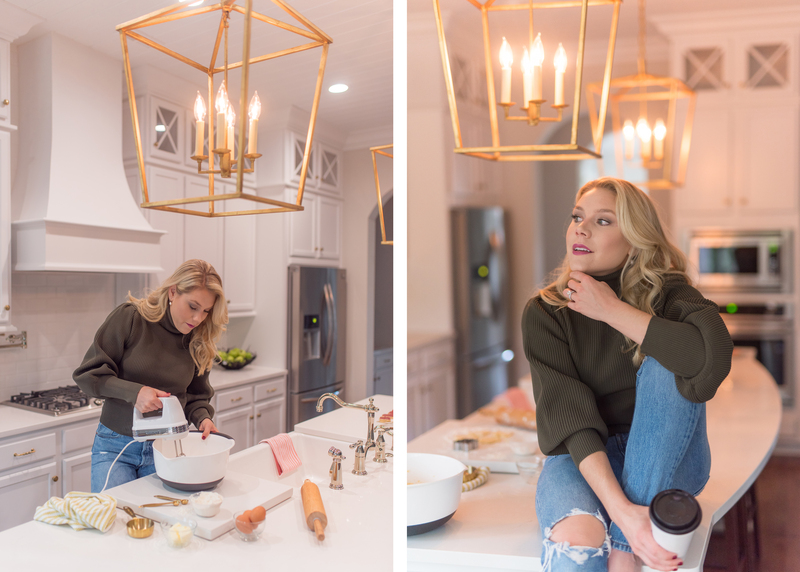 The cream cheese frosting might just be my favorite part! 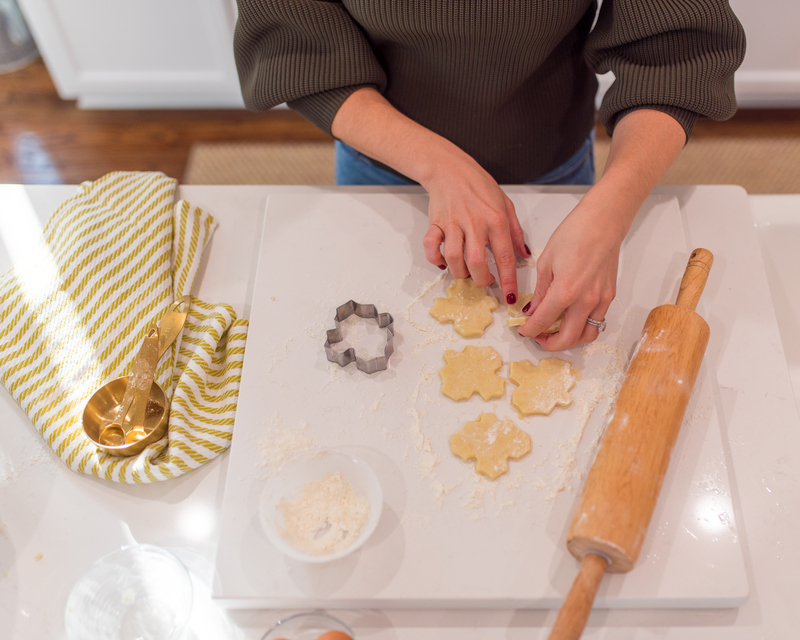 Something about the change of weather and keeping cozy inside makes me want to whip up a batch of cookies. Thankfully I married a man who loves sweets as much as I do. This gives me all the more reason to make the holiday cookies that I grew up baking. 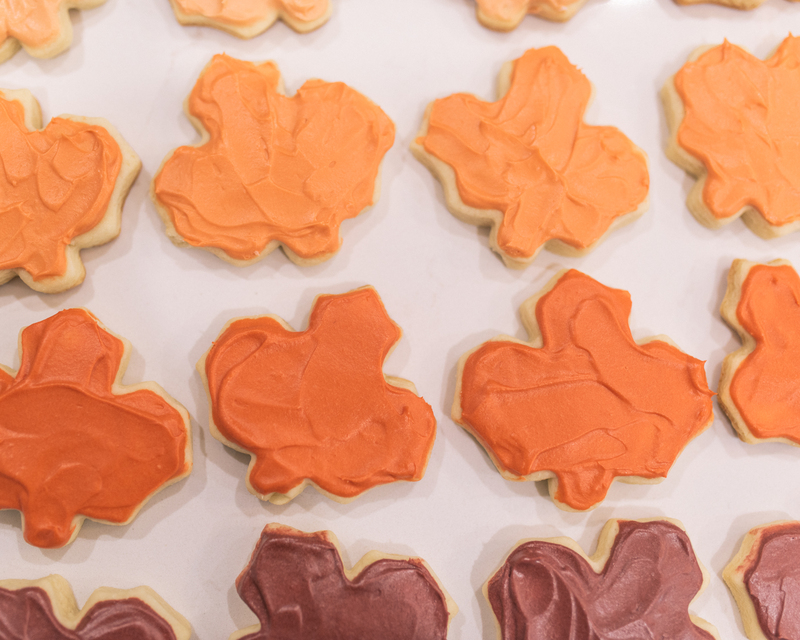 Half the fun in making cookies is decorating them! 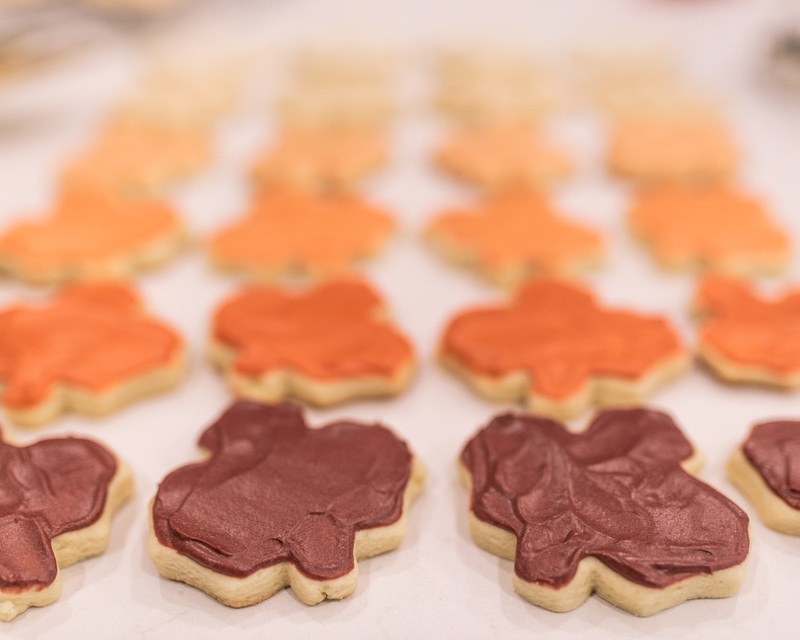 I got the bright idea early on to do maple leaf cookies in autumnal colors. I used food coloring to make the different shades of orange, caramel and deep purple. Without even realizing it the colors I had created were a gradual fade: deeper and brighter than the color before. I didn’t use any fancy food coloring, just a standard box from the grocery store. I mixed the colors red, yellow and orange together until I had made the color I desired. This chart (here) is a good reference. I found it when I set down to write this post! Pre-heat the oven at 350°F or 325°F for convection. Line cookie sheets with parchment paper. In a medium-sized bowl, cream together butter and granulated sugar until light and fluffy, about 3 minutes. Add egg and mix until well-combined. Add in flour, salt, baking powder and vanilla. Place the combined mixture in the fridge for 20 minutes. 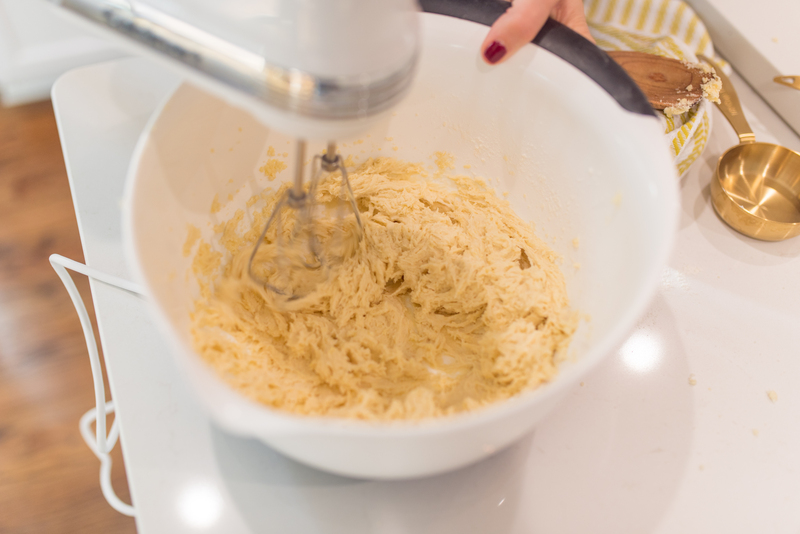 Remove the dough from the fridge and, on a lightly floured surface, roll out the dough to ¼ inch thick. 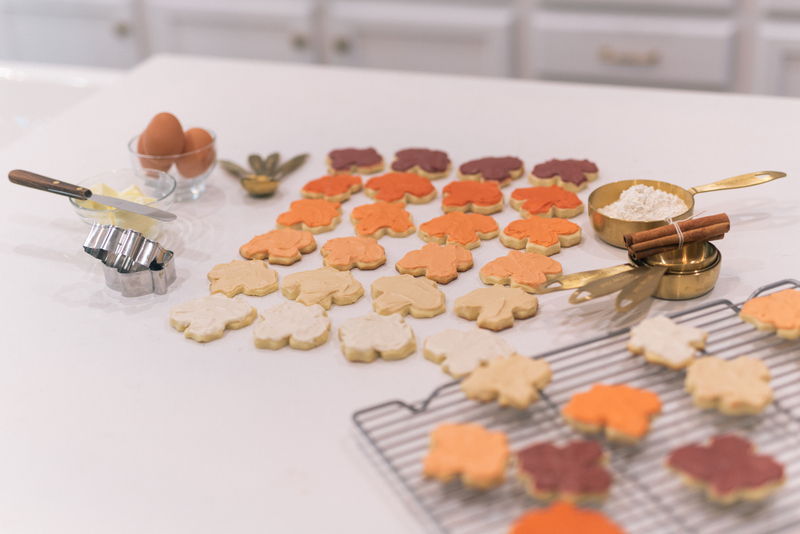 Cut it into desired shapes and place them on the parchment-lined baking sheets. Bake in the oven for around 8 – 10 minutes until the edges are just golden brown. Remove them from the oven and cool on a wire rack. 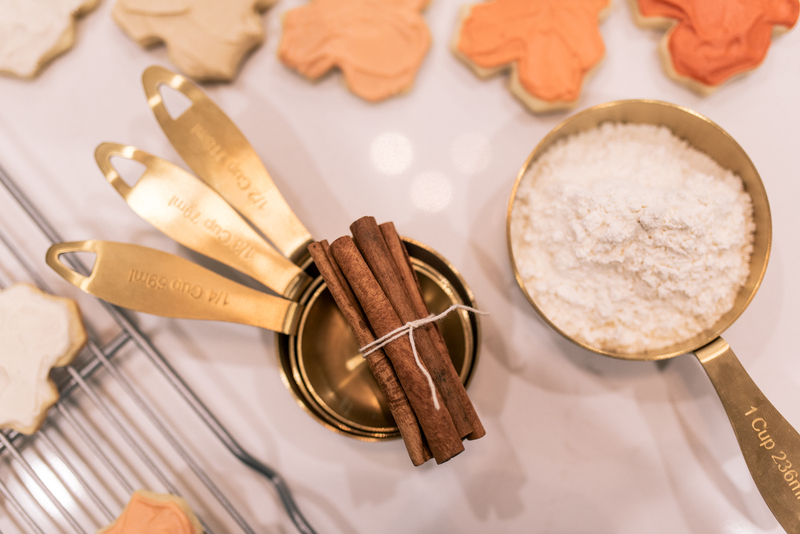 Depending on the size of your cookie cutter, the baking times will differ. For chewy cookies bake for a shorter period. Combine all of the frosting ingredients in a medium-sized bowl and mix together until creamy. Using an icing knife, top cookies with a layer of frosting. I’m inviting myself over for a house tour and some cookies! So cute, TR!